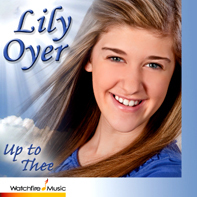 Lily Oyer’s crystal clear vocals supported by lyrical piano and strings make this debut compilation of poems, psalms, and prayers destined to uplift, comfort, and heal the hearts of all ages. Upbeat, tender, and gently reassuring offerings include inspired original compositions by Lily and her mother/accompanist, Laurie, as well as cherished inspirational favorites for your listening delight. God is all to me and you. God’s light, God’s Love, God’s light. Pure ideas that light your path. True Love, true light from God. Key to the Scriptures by Mary Baker Eddy. Used by permission. Thank God for all His goodness everyday. 8 © 1995 Lightchild Publishing BMI. Used by permission. Be it slow or fast.